Italian Mother Syndrome: Julia is UN employed!! I've waited nearly three months to write a headline like this (and four days for this particular typographical joke). Why? BECAUSE I AM EMPLOYED AGAIN! That's right, kids, I'm stepping out of the breadline and back into the working world. You can now find me at the United Nations Foundation as part of the Web team, saving the world through content, outreach, and other online fun that supports the many fine UN programs. So between starting work again and performing in Hexagon Theater's "What So Proudly We Bailed" (order tickets now!) over the next month, I can't promise the same volume of blog posts. Rest assured, though, I will try my damndest to continue delivering nourishing food for thought to y'all. Because let's face it -- I'd rather be blogging than sleeping. Also, lest you think me ungrateful or forgetful, BIG FAT HUGE THANK YOU to everyone who supported me throughout this process, from contacts to free meals to meetings to prayers to comments to phone calls to hugs to the occasional alcoholic beverage. You all rock my socks. And though I don't want to have to return the favor -- i.e. may you all remain safely and happily employed -- know I am always here for you when you need help. Hooooooooooray to you! That sounds like an awesome new gig. Congrats to being employed again. Perfect timing, too. Congrats! I'll be looking out for updates on the great work you'll be doing with them! Julia - that's the best news! 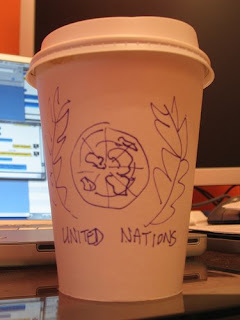 UN Foundation is a great organization and they are soooo lucky to have you. Enjoy. I look forward keeping up with all your adventures! Did you and Sus coordinate this or what? Strange, but exciting! Congratulations! have had a good day ! The therapist gave me a 95. I go back in three weeks and I hope that will be my last trip. So proud of my bestest. Go be balm :) to a world in need. You rock! "When you get laid off, it's not the end of the world, it's an opportunity to redefine yourself and improve your career or change your career altogether. Think of it as a second chance. The right attitude always prevails… so if YOU are laid off, the more you mope, the less you accomplish." Julia-You have the right attitude! And you are a winner! Congrats, Julia! :-) Sometimes, the right job is worth the time it takes to find it. Go forth and improve the world!! Congratulations. That is good news on two fronts: one: you got what sounds to be a fantastic new job and two: that is a good sign for the rest of us who are still looking for new positions! Funny Baby Pictures: And the bow does what? New meaning for the phrase "skee ball"
Come hail "What So Proudly We Bailed"! Happy anniversary to DC me!